Do I have pests and disease in my garden? I think I might have pests and disease in my garden I'm in south east michigan. I know I have seen a few slugs so I'm going to want to do something about them so they don't get out of control and I end up with tons of them. I had leaf lettuce at the beginning where I first noticed them. But after a week or two I wasn't seeing them any more (night or day). Today I noticed a few on my jalepeno plants. I also noticed a jalepeno pepper here and there that has a hole bore in it but no sign of an insect that made it. I also have sweet banana peppers and green bell peppers but I haven't seen any signs of that with them and they are right next to the jalepeno plants. My broccoli plants have tons of little holes in all of the leaves but I never seen any insect activity on them but I'm assuming that the holes are from insects. The broccoli came out great and I'm still getting offshoots. My dad tells me my tomato plants have a fungus. The leaves are withering and dying. 4 of my 8 plants are nearly dead. I've harvested probably 100 tomatoes so far from them. And have a few dozen more green or just starting to vine ripen on the plants to go. I'd like to avoid using chemicals which is why I'm posting here. However I wouldn't say I'm 100% organic gardening. I used ortho weed killer near the beginning of starting the garden to deal with a grass starting to grow in the garden problem. Which worked for a time. And about 2 weeks ago the problem cam back and is somewhat out of control now. I has grown where my leaf lettuce was and spread under the tomato and jalepeno pepper plants. I can't spray them with the ortho stuff or anything that I'm aware of without killing off those plants. And my plants are so big that it is pretty much impossible to get the grass from the roots up. I fear at this point even if I could pull it all up root and all that it will just keep growing more every day. Taking all the time I have for the garden in just dealing with the grass. The fertilizer I use I'm not sure if it would be considered organic. They are: osmocote smart release (scotts company) [19-6-12] and vigoro (swiss farms products) [12-10-5]; I also have but didn't use this year jack's classic all purpose (JR peters inc) [20-20-20]. The first two are time released worked into the soil at the beginning of the season according to the packaging and the last one is mixed with water and applied regularly through watering (daily and weekly mix options). Being new to gardening I didn't prepare myself very well this year. So here I am finding out the hard way. What can I do to take care of and/or prevent these problems? There are probably only about 8 more weeks in the season here. I seem to recall frosts start happening in late october. So everything I learn this year will make my garden all the better next year hopefully. Re: Do I have pests and disease in my garden? Well, it's fair to say there are always pests and diseases in the garden. As a gardener, one of the things you learn is identifying them and learning how to prevent them or deal with them. Personally, I like to push the organic envelope further and try to get predators -- beneficial microbes, bacteria and fungi and beneficial insects, birds, and animals to deal with them. I like to work to make the soil healthy and thereby, make the plants healthy so that they have stronger immune system to fight off the diseases. I think you ARE describing pests and diseases in your garden. It's probably best to start new threads or join discussions that are relevant to each plant or specific pest or disease. That way we can focus on each problem individually. ...be prepared to get A LOT of input... We like to help. That's the thing I have no idea what pests or diseases they have. I'm very clueless. I can grow stuff good but have no idea how (other than the slugs) identify what I'm dealing with. Oh and the grass or weeds. They are easy to see when they present. I would like to deal with the grass and weeds but other than weed killer chemical I'm not sure how to deal with them. I didn't really have any weeds this year just the grass problem. When I have some time in the next couple days I'll try and find a current relevant discussion for each plant or start one for each if I can't find out. I've ran out of time for tonight. But since you brought up researching the products I've been using should I be quite concerned with the fertilizers I'm using? So concentrated synthetic fertilizers are not poison to us, but they pretty much are poison to all that microbial life of the soil. And they don't have any of the other benefits of using organic soil amendments like compost: holding moisture in the soil, correcting the tilth and texture of the soil (moving both clay and sand soils towards loam), keeping it loose, aerated, properly draining etc. that is flea beetle damage. That's actually good news, because they aren't much risk to the plant or to the edible buds of the broccoli: "Although flea beetles are common, injuries often are insignificant to plant health. On established plants, 10 to 20 percent or more of the leaf area must be destroyed before there is any effect on yields." http://www.ext.colostate.edu/pubs/insect/05592.html That article has more about flea beetles. or even skeletonized as the slugs eat all the tender leaf material and leave the tough veins. Flea beetles I don't worry about too much, but slugs have to be dealt with, because those lacy or skeletonized leaves can no longer collect energy for the plant. If you are thinking of being an organic gardener, adding good compost after every planting helps to feed the soil. Organic fertilizers and amendments are available. The certified products will have "OMRI" stamped on the container. Most organic fertilizer numbers are below 10. If the source material is bone, fish, kelp, cottonseed, blood, or from a source that was once living, or manures then it is organic. Naturally occurring mined minerals are also considered organic. Also realize that an organic garden is still an ecosystem which means that you should provide habitat and plant some plants to attract beneficial insects to help control the bad insects and use pesticides only when absolutely necessary. 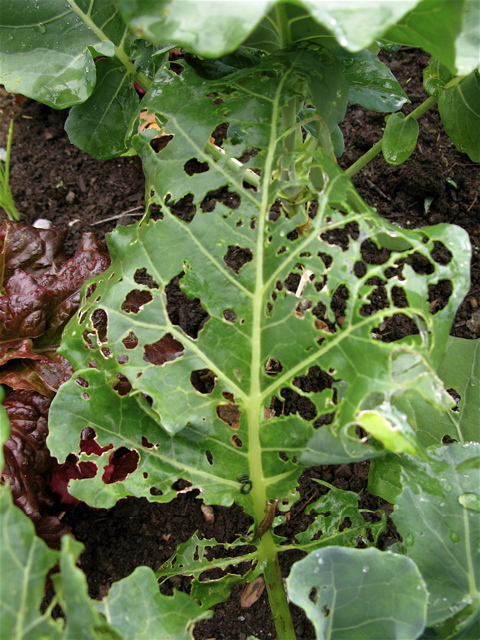 In a balanced garden there will always be some insect damage and if you select the right cultivars, keep them spaced properly and healthy, disease will be minimized. If you do not tolerate any bugs and reach for the chemicals (even organic ones are still chemicals), you will be riding the pesticide treadmill and you will have to keep it up constantly to have a bug free garden because all of your predators will either be killed or move on. Selecting the right cultivars for your area will help control many of the diseases but unless your garden is in a controlled environment it will be hard to control the weather. Fungal diseases like humid conditions after a rain. That is the only time that I would use a preventive anti fungal spray. You could still have a great looking garden, but you will be working hard to achieve it. yeah, hard to give you a whole course in gardening in one thread. If you don't know about composting, browse in our Compost Forum. Best thing you can do for your garden. Re the grass and weeds: After all the plants are finished this fall, turn all the soil over, turning the grass under. Then lay down cardboard and wet it down. Cover it with lots of organic stuff- grass clippings, fall leaves etc. By spring it will be pretty broken down. Turn it all into the soil and then mulch heavily and keep your soil well mulched forever after. It holds moisture, suppresses weeds, and breaks down to feed the soil. If your garden bed is adjacent to lawn, you will have to put in some kind of edging that extends about 6" down in to the soil. Otherwise the grass will continually be coming back in to the bed. Thanks for the tips they will come in handy for me next year. I think I'll see about composting and what not as well rather than using these fertilizers. My brother knows of this place around here we can take all the manure we want (we have a small trailer we can use for that). Plus I have heard of a compost box thing you can do in the backyard using certain food waste products from the kitchen that commonly is just tossed in the trash. On the broccoli topic, the holes are bigger so I think it is safe to say it's the slugs then. I'll do that carboard thing at the end of this season and follow that mulching thing. And I have a lot of black plastic flexible edging that can be used to surround the garden. I'm pretty sure it is 6 or 8 inches. I'll check out that thread too. Is there a point at which it is too late to fix a fungal problem? Given that the 4 of the 8 are probably 90% dead looking I'm wondering if they are lost. I would pull them if they are too far gone before they spread any problems to the other plants. It takes a while to find out what grows well in the garden. Sometimes you have to find the right cultivar, sometimes you just have to find the best spot for everything. Going out every day and checking on the plants to identify and treat problems early really helps. Going out in the evening with a flashlight and going slug and snail hunting helps too. Fungal diseases are much easier to prevent than cure. If you have powdery mildew then look for resistant cultivars, the same with downy mildew. Fungal diseases are worse when it is humid after a rain, so that is usually when you do the preventive anti fungal sprays. take off the lower leaves off the tomatoes, and take off and destroy any infested leaves. Make sure the leaves are not left on the ground. Sanitation is key to controlling the spread of disease. Make sure the plants have lots of room for the air to circulate. The compost bin in the backyard is what I was talking about, but there is some art/technique to it (mainly about that carbon nitrogen balance). If you don't pay attention to that and just throw kitchen scraps in a box, you can end up with a stinky, slimy mess. (Compost bins done right will have NO bad smell.) Like I said, do some reading in the Compost Forum. Everything you need to know about composting is there! Pests in garden! help please!